My sewing machine has missed me, too. It's been waiting for me to come back and finish Asai's quilt. I'm actually pretty close; there is a nonzero possibility that I could get very close, or finish entirely, with a diligent weekend's worth of work. My brain is starting to think about the next quilt, as I finish this one off. Next is Jason and Crystal's wedding quilt, which will consist mostly of fabrics I bought in Hawaii. It will be a simple quilt, mostly squares, and almost certainly a one-patch quilt, in shades of red, black, grey, and possibly white. The backing will be the killer red brocade I found in California. I always keep something about the quilt slightly secret from the recipients, and this time around, it's the backing. 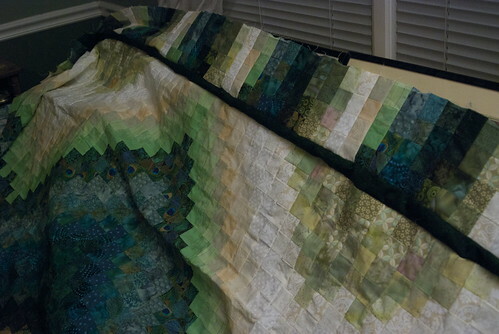 Getting those two quilts out of the way frees up a large portion of my queue. I have a wedding quilt slated for Adam, but his wedding isn't until next summer, and the design for that quilt is still percolating in my head, anyway. I know that Hallie would like some help in getting some incredibly old quilt squares sewn by a great-aunt put together into a finished quilt, but that shouldn't take long. Past that, I'm giving serious thought to taking some of these fabulous leftovers I've been amassing, and cutting pieces for scrap double wedding ring quilts to work on as I feel like it. I've been carefully stashing scraps away, and I think it'll soon be time to do something with them. It'll be nice to have caught up on all the wedding quilts, though. As hobbies go, this has been unexpectedly rewarding. Given how I hated every attempt at sewing I made when I was younger, I'm amazed at how satisfying I find piecework. Perhaps I'm older, more patient, more OCD ... or just like the idea of a hobby that, in the end, keeps the people I care about a little warmer at night. Someday, I might even keep a quilt for myself.